The Fernie courses were inspected earlier this afternoon and found to be in good order at that time, with soft going, albeit that inspection did take place ahead of the latest batch of heavy and persistent rain to hit the East Midlands. A further course inspection will take place on Saturday morning, with confirmation of our intentions by 1pm latest on Saturday. We have now completed all the work which is necessary to run the event, but if the rain continues (as is the case this evening) there must be doubt as to whether it will be possible to run the event on Easter Sunday. Therefore contingency arrangements are also being investigated. Please DO NOT ATTEMPT to visit the site or walk any of the courses until after the next announcement at lunchtime on Saturday. We are doing our best but the weather is certainly not helping! The Roger Helmer MEP Terrier Racing will take place during the lunch interval. Catering, Refreshments & Tradestands:- There will be a licensed bar with hot and cold refreshments. Weather:-In case of poor weather conditions please check website, or call 0116 3390010 on/after 2pm on Saturday 31st March. To start at approx. 9.30am. The course is 1¼ miles long, with about 17 inviting & well-built natural cross country fences, height 2’9” – 3’0”. There will be two sections: Speed & Bogey Time, both sections will run concurrently. Riders must be aged 16 or over to compete in the Speed section, and must nominate beforehand which section they are entering. Prizes: Prizes in kind. Rosettes to 6th place in each section. The Fernie Puppy Cup to the winner of the Bogey Time section. A Special Prize will be awarded to the highest placed ‘Young’ team consisting of Riders who are aged 15 and under. To start at approx. 12 noon. The course is 2½ miles long with about 29 inviting & well-built fences. Teams must have qualified at a Skinner’s Pet Foods Open class during the 2017/18 season (i.e. between Saturday 15th April 2017 and Sunday 25th March 2018). Prizes: 1st – £1,000, 2nd - £500, 3rd - £200, 4th - £150, 5th - £150, 6th - £100 – subject to 12 or more teams starting. Rosettes to 10th place. The Goring Hotel Challenge Cup to the winning team. The Junior Cup will be awarded to the most promising Young Rider, at the discretion of Debbie Topping and the Stewards on the day. Additional prizes donated by Retraining of Racehorses (RoR) will be given to owners of ex-racehorses running under their former racing name who are registered with RoR. The owner of the horse(s) who completes the course in the highest-placed team will receive £500; 2nd placed team - £250; 3rd placed team - £100. If there is more than one RoR registered horse within a team, each ex-racehorse with receive a similar prize. Riders must state their horse’s ‘Racing Name’ at point of entry. Prizes will NOT be awarded to ROR registered horses if Organisers are not notified in advance of their ‘Racing Name’. To start at approx. 2.00pm. The course is 1¾ miles long, with about 25 inviting & well-built natural cross country fences, height approximately 3’3” - 3’6’’. This class will be judged on a timed section over about ¾ mile, which includes a hunting gate to be opened and shut. Eligible teams must consist of three or four riders, with no more than 1 team member having ridden in the Team Chase National Championship in the last 3 years. All riders must be subscribers from one Hunt only and must provide a certificate to that effect from the Master of their Hunt (see entry form for further details). Riders must be aged 16 or over. A travel allowance will be returned to competing teams, on return of number cloths to the Secretary’s Tent on day of the event only, based on £20 per team for those teams from Hunts whose kennels are more than 50 miles away and £30 per team for those Hunts whose kennels are situated over 80 miles from the course. All distances will be measured as the crow flies from the venue of the event to that hunt’s kennels. The Organiser’s decision on amount of allowance to be paid to a team shall be final. Prizes: 1st - £750, 2nd - £350, 3rd - £250, 4th - £150 – subject to 18 or more teams starting (paid directly to the team’s Hunt). Rosettes to 6th place. The Admiral Hill Founders Cup to the fastest Adjacent Hunts team with other special prizes. The Henry Beeby Cup to the Best Fernie Team with other special prizes. To start at approx. 3.15pm. The course is 1¾ miles long, with over 26 fences height approximately 3’6”. The FERNIE INTERMEDIATE is an Allcomers class for teams of 3 or 4 riders judged against the clock. Riders must be aged 16 or over. Prizes: 1st - £200, 2nd - £100, 3rd - £80, 4th - £50 – subject to 10 or more teams starting. Rosettes to 6th place. The Fernie Cup to the overall winner. Entries received after this date will be accepted at the discretion of the Event Organisers, and will be subject to a late entry fee. Please forward an SAE if you wish to receive your complimentary car pass(es). Number Cloths & Equipment Checks:– A £10 deposit will be required for Number Cloths on declaration at the Secretary’s Tent, which will be refunded in full when a complete set of Cloths are returned. All team members must bring their tagged crash hats and body protectors to the Secretary’s Tent for spot checking when their Team declaration is made. BTC tags will be available for approved & kite-marked hats. 1. MARKING OF COURSE – The Novice Class course will be marked by white numbers on a blue background, the Championship will be marked by white numbers on a red background and The UK Hunt & Intermediate Team Chase courses will be marked by black numbers on a white background. 2. WINNING TIME – The National Championship, ROR Fernie Intermediate & Novice “Speed”, the fastest team to complete the course will win. The UK Hunt Team Chase, the fastest team to complete the special timed section of the course (to be known as ‘The Hunting Zone’) will win, so long as the 3 counting Members of the team do not incur any rider or horse falls on the entire course and the time they take to complete the entire course is not be more than 30 seconds slower than the total time of the fastest team’s entire round. The Novice “Bogey” Class, ‘the team nearest the ‘bogey’ time will win. The ‘Bogey’ time will be determined by the organisers in advance of the event, and will be equivalent to a standard hunting pace around the course in the prevalent conditions. Falls will be penalised by time only. In the event of a dead heat between teams, the time of the fourth horse will count. 3. DAMAGE TO FENCES – When damage occurs to a fence, the event will continue at the discretion of the Organisers with that part of the fence damaged marked with white crossed sticks which must not be jumped by the competitors. 4. DRESS – Competitors in the Novice, Intermediate and National Championship Classes must wear standard cross country dress. All teams in the UK Hunt Team Chase will be required to wear either standard Hunt dress or a black, blue or red jersey to match normal hunting attire. Body protectors may be worn either under or over Hunt Dress or Black/Blue/Red Jerseys. 5. NUMBER CLOTHS – The deposit for the 4 number cloths (MFHA rule 26) will only be refundable when ALL 4 cloths are returned. These must be worn by all team members in accordance with the colours declared in the event Programme. Failure to do so will incur elimination from the competition. 6. TEAM CAPTAINS – It is the Team Captain’s responsibility to ensure that each member of the team has read and adheres to all the rules. 7. EXERCISING OF HORSES – Horses may only be exercised in the area provided. No competitor may ride on, or over, or near the course or nominated car parking areas, except when actually competing. 8. CUPS – All cups must be returned to the Hon. Secretary at least 7 days prior to the following year’s event – any damage or loss must be reimbursed at cost of replacement. The holder shall be responsible for insurance of the cup. 9. DOGS ON LEADS – All dogs must be kept on leads at all times. 10. COMPLIANCE WITH OFFICIAL DIRECTIONS – Riders and Owners of competing horses and their grooms must obey any order or direction given to them by a responsible official and in particular they shall not do anything liable to upset or hinder the smooth running of the Event. 11. PRIZEGIVING – All competitors are encouraged to attend the prizegiving. The winning teams shall be required to attend photocalls and give interviews to journalists where requested by the organisers. 12. CAR PASSES – Admission to the event in any vehicle other than a horsebox will only be permitted where a valid car pass can be displayed to the gateman or on payment of the appropriate admission price. Car passes will be circulated to all officials in advance. In addition each team competing in the Novice Class will be eligible for one £10 car pass on receipt of an s.a.e. by the Hon Secretary. Each Inter-Hunt/Intermediate team will be eligible for two £10 car passes & each Open team will be eligible for three £10 car passes. No further car passes will be available prior to the event, and a team’s car pass(es) will not be sent out other than where an s.a.e. is received by the Secretary in sufficient time prior to the event. 13. OVERNIGHT ACCOMMODATION – If help is required with overnight accommodation and/or stabling for team members and their horses (which can be provided locally), please contact the Secretary as early as possible for details of appropriate contacts. The Team Captain shall be held responsible for any unsatisfactory late cancellations of confirmed bookings. All requests must be made before Saturday 25th March. 1. Entries will only be accepted for The UK Hunt Team Chase from teams of three or four subscribers or hunt servants from one Hunt only, with the name of the Hunt in front of the Team name (eg. Fernie Friendlies, Warwickshire Wobblies, Puckeridge Punters, Tiverton Tigers, Tynedale Thrusters etc). The competition is open to subscribers and hunt servants of all properly recognized packs of hounds in the United Kingdom and Ireland, including any drag or bloodhounds providing they are properly registered with their relevant hunt association. 2. Entries for The ROR Fernie Intermediate and The UK Hunt Team Chase will be accepted from teams of three or four riders who are sufficiently competent to tackle an Intermediate Team Chase course. 3. No team in the UK Hunt Team Chase may consist of more than one rider who has previously competed in the National Team Chase Championship during the preceding three years. 4. Each Hunt may enter as many teams as it wishes. In the event of over-subscription, entries will be limited and it may be necessary to restrict the number of teams per Hunt. 5. Each UK Hunt Team Chase team must have confirmation from a Master of their Hunt that EVERY member of the team is a subscriber to, or Hunt Servant of, the Hunt they are representing and has hunted on at least four occasions with that hunt during the current season, in order to make their entry valid (the signature of the Master is required on the entry form). The organisers reserve the right to seek further clarification if required. 6. Late substitutions will be allowed, but the additional Master’s Certificate in respect of any late substitute must be lodged with the Secretary in advance of the competition. 7. In the UK Hunt Team Chase (only), at least 3 members of every team will be required to pass through a hunting gate which must be opened, passed through and properly shut by at least three members of that team and the gateshutter must have remounted before any members of the team jump the next fence in the timed zone. A steward will indicate when the gate has been satisfactorily shut. Any team failing to do so will incur a 15 second time penalty. 8. Teams will only be eligible for prize money if the 3 counting members of the team complete the entire course without a horse or rider fall. 9. Any team completing the UK Hunt Team Chase course in a slower time than the “Maximum Available Time” posted on the day of the event will not be eligible for any prizes within that competition. This time will be calculated on the basis of a slow hunting pace around the entire course in the prevalent conditions. Teams will only be eligible for prize money where they complete the entire course in a time which is within 30 seconds of the fastest team around the entire course during the class. 10. In the UK Hunt Team Chase (only) a travel allowance will be returned to competing teams, on return of number cloths to the Secretary’s Tent on day of the event, based on £20 per team for those teams from Hunts whose kennels are more than 50 miles away and £30 per team for those Hunts whose kennels are situated over 80 miles from the course. All distances will be measured as the crow flies from the venue of the event to that hunt’s kennels. The Organiser’s decision on amount of allowance to be paid to a team shall be final. This event is being organised by Fernie Hunt. Equine Bookings is acting as the booking agent for this event, enabling you to book online, for which you will be charged a booking fee per space which will be added to your cart. 1. ACCEPTANCE OF RULES All Events run under the auspices of the MFHA Governing Body shall be run in accordance with these Rules and shall accept and be bound by these Rules. Such events shall be referred to at all times as British Team Chasing or “BTC” events. All competitors at such events shall also accept and be bound by such Rules. Individual BTC event organisers or committees may not impose their own Rules for their event but may impose administrative regulations as they see fit. 2. RIDERS RESPONSIBILITY In the case of any Rule affecting riders or their horses, the rider shall be held responsible. In particular riders will be held responsible for adhering to Rules 7 (Protection), 9 (Age), 13 (Horse Welfare), 14 (Abuse of Horses), 15 (Exchanging Horses) and 20 (Personal Accident Insurance). 3. STEWARDS AND APPEAL BODY There shall be one or more Stewards appointed by each BTC event organiser whose decision in respect of these Rules and of Discipline at that event shall be final, except by later appeal to the Governing Body on payment of a deposit of £50. Where any such appeal is submitted, the Chairman of the BTC Committee will appoint a panel of not less than 3 people with appropriate skills and experience (with a nominated Appeal Chairman) to determine the matter finally and with any appropriate sanction, and in such manner as the panel deems appropriate. The Stewards at a BTC event shall also have the right to refer any matter at their event to the Governing Body for final determination and sanction in a similar manner the appeal process. Local Mounted Stewards will be on the course at BTC events with authority to stop any competitor continuing on an exhausted horse or ill treating their horse. If they are not obeyed the whole team may be eliminated. 4. TEAMS Each team shall consist of a maximum of four horses and riders and at least three horses and riders shall complete the course successfully for that team to finish. 5. MEDICAL MATTERS No event shall commence unless one Doctor, two Paramedics (which for the purposes of this rule shall include such other professionally qualified and trained medical personnel of the same or an enhanced standing) and two Ambulances are on duty on the course. All BTC event organisers should be aware of and adhere to the medical safety Rules: a) No team shall be allowed to start unless either a fully equipped 4 wheel drive Ambulance and a paramedic, or an appropriately staffed Rapid Response vehicle, or another Ambulance and a Doctor are available on the course (as one Ambulance may be off-site or travelling to hospital with an earlier casualty). In such circumstances the organiser must be satisfied that the remaining on-site event medical cover is sufficient to handle a further competitor accident. b) The medical team must have radio links around the course to Control. c) The medical team must be familiar with the course and know the quickest route to any part of it. d) A suitable level of medical equipment, including stretchers for moving injured persons, must be available on the course and at least one 4WD vehicle with driver capable of carrying such stretchers should be available. e) The local Accident and Emergency Unit and Air Ambulance Unit should be informed of the event at least 2 working days in advance of the event, and provision for telephone contact be known. f) Ambulances should not be used as transport for uninjured persons, or for hospital transit of patients with minor injuries only, unless authorised by the on-duty Doctor. 6. CONCUSSION Any rider who sustains concussion shall under no circumstances compete again for at least the remainder of that day, or until fully satisfied thereafter that there are no lingering effects from concussion. It is strongly recommended that competitors seek the advice of a qualified Doctor before competing again. British All PAS015 1998/2011 with kitemark; VG1 with kitemark; All ASTM F1163: 2004 onwards with SEI mark; SNELL E2001 or E2016 with Snell label and number, or Australian and New Zealand All AS/NZS 3838 2006-onwards hats. Competitors are strongly recommended to check their hats regularly and to replace them if damaged or following a fall. All those mounted at a BTC event (including grooms and helpers) must wear a hard hat complying with the above standard. All competitors must also wear a British Equestrian Trade Association (BETA 2009) approved and appropriately labelled Level 3 (purple label) body protector, manufactured in the year 2009 or after. A body protector of this nature is also required when competitors are wearing air jackets of any make. All horses being ridden at an event, including riding in exercise areas, must be ridden in a bridle with reins directly attached to a bit or leather ‘D’ rings or attached as per the manufacturer’s specification to a purpose designed bitless bridle (such as a mechanical or jumping hackamore, Dr Cook, Sidepull or Scawbrig). Any persons riding a motorcycle, Quad Bike or similar at an event may only do so with the organiser’s express consent in advance, and providing that the operator wears a helmet at all times when the vehicle is in use. Passengers must not be carried on the vehicle at any time. 8. ACCIDENT REPORT FORMS An Accident Report Form is to be given to each fence steward (blank forms available from the MFHA Office) and must be completed for any Accident and returned to the Event Secretary (or Organiser). Such completed forms must be kept by the Organiser for a period of five years, or in the case of a person under the age of 18, four years after they become 18. These forms must be made available to the Course Inspector in subsequent years. 9. 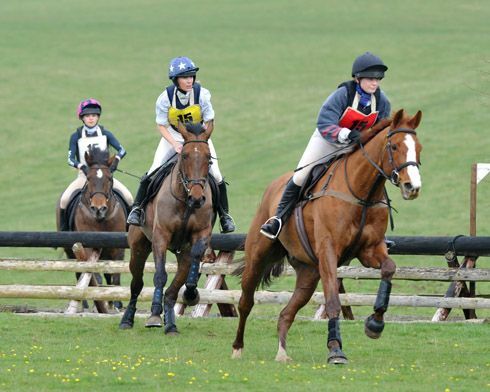 RIDERS AGE AND EXPERIENCE No person shall ride until they have attained the age of sixteen in any BTC Open, Intermediate or Novice Classes which are run against the clock and all riders competing in such classes should ensure that they have had appropriate experience of cross country riding. At the discretion of Organisers riders under the age of sixteen may be permitted to compete in classes judged against the “bogey” time. Any rider who is found to be in violation of this rule is deemed to be riding entirely at the risk of themselves and their parents or guardian, and will be subject to immediate disqualification from the event at the BTC event organiser’s discretion. 10. VETERINARY MATTERS AND PAYMENT FOR SERVICES There must be at least two Vets available on course at each BTC event. The decision of the course Vet to put a horse down on humane grounds must be accepted by all competitors. Competitors will be expected to pay for any services received from the veterinary surgeon, farrier, horse ambulance, doctor or any other medical services. 11. HORSE CASUALTIES Organisers shall make adequate arrangements to deal with horse casualties, which will include the provision of suitable screens, appropriate methods to euthanase a severely injured horse, at least one horse casualty wagon, and a separate vehicle suitable for use as a Horse Ambulance and towed by a 4WD vehicle. 12. EXHAUSTED HORSES A nominated Steward or Stewards, who must be mounted, shall be appointed to stop unfit or exhausted horses from continuing. Such an official or officials, who must be readily identifiable, shall be appointed at every BTC event. 13. HORSE WELFARE The whip should only be used for good reason, not excessively, in the right place and at the appropriate time. Spurs must not be used to reprimand a horse and a bit should never be used to abuse or reprimand a horse. Horses competing in BTC Intermediate and Open Classes must be five years old or over. 14. ABUSE OF HORSES Any act or series of actions, which in the opinion of the Stewards constitutes abuse of a horse shall be considered to be a breach of these Rules and will incur elimination. 15. EXCHANGING HORSES No rider may exchange horses once a team has started. No horse may start more than once in any class or more than once in any speed classes on a single day. (a) Horse Falls – When a horse falls during any BTC class, the competitor is immediately eliminated and must retire. If the competitor does continue on the course following a horse fall their team will be eliminated. A horse is considered to have fallen when at the same time its shoulder and quarters have touched either the ground or the obstacle and the ground, or when it is trapped in a fence in such a way that it is unable to proceed without assistance or is liable to injure itself. This does not prevent horses which stumble or refuse, thus unseating the rider, from being remounted to continue, subject to rule 16 (b). (b) Rider Falls – After two falls which are not Horse Falls the competitor is immediately eliminated and must retire. If the competitor does continue on the course following two Rider Falls their team will be eliminated. It is recommended that competitors who suffer a heavy fall should see an on-duty Doctor before leaving the event; however competitors and their team members are to take their own responsibility in doing so. 17. REFUSALS The number of refusals shall not exceed three at any one fence, or five on the course per horse, when the competitor shall be eliminated and must leave the course at once. The Team will be disqualified for an abuse of these rules by any individual member. 18. COURSE INSPECTION All BTC courses will be inspected prior to an event by an Inspector appointed by the BTC Committee, who will need to be satisfied that the course meets the necessary Rules, safety standards and Course Construction Guidelines before permitting the event to go ahead. Organisers must ensure that they permit Course Inspectors early access to allow time for making any alterations required. The appointed Course Inspector should contact the Course Organisers to arrange an inspection date. 19. UNAFFILIATED EVENTS No rider may compete in the BTC National Team Chase Championship, who has taken part in an unaffiliated cross country team event during the current season. Events sanctioned by the Governing Body, the British Horse Society, the Riding Clubs and the Pony Club are exempt from this Rule. 20. INSURANCE All events shall ensure that public liability insurance cover for at least £10m is in place. Personal Accident Insurance: The following wording MUST BE printed on all entry forms: “It is a requirement that all participants carry Third Party insurance for not less than £5m. It is also strongly recommended that all participants have Personal Accident Insurance.” 21. ORGANISER’S RIGHTS The Organiser of any BTC event reserves the right to cancel any class or event, to transfer competitors between classes, to refuse any entry, to alter advertised times, to withhold all or any prize money, and to eliminate or prevent any competitor from competing who is adjudged not to be adhering to the Rules or who is deemed to be wearing or using inappropriate dress, saddlery and/or equipment. 22. DISCLAIMER OF LIABILITY Save for death or personal injury caused by the negligence of BTC event Organisers for which they are legally responsible, neither the Organisers of any event to which these Rules apply, nor any representative of these bodies or the Governing Body of Team Chasing accepts any liability for any accident, loss damage, injury or illness to horses, owners, riders, spectators, land, vehicles, contents or accessories or any other person whatever, whether caused by their negligence or in any other way. 23. CLASSES Only the following terms shall be used to define classes at BTC Events: a) Novice. Fixed obstacles which are a minimum height of 80cm (2’8”) but not to exceed 100cm (3’3”). Length of course to be approximately 2,414m (1.5 miles). b) Intermediate. The majority of fixed obstacles to be approximately 107cm (3’6”), but not to exceed 115cm (3’9”). Length of course to be approximately 2,816m (1.75 miles). c) Open. The majority of fixed obstacles to be not less than 107cm (3’6”) but generally not more than 120cm (3’11”) other than in specific and safe circumstances. Length of course to be approximately 3,219m (2 miles) and not less than 2,414m (1.5 miles). Organisers should also note: i) If the term “Allcomers” is used, it must be preceded by the word “Novice”, “Intermediate” or “Open”, whichever best describes the course. ii) Only “Open” or “Open Allcomers” classes may be considered as qualifiers for the BTC National Team Chase Championship. iii) Events that have an Open Qualifier must run their Intermediate class against the clock (but can run part of the class or another similar class against a Bogey Time). iv) A “Fun” class may be held entirely at the Organisers discretion, but must be decided by a “bogey” time. 24. THE PEN The first three horses entering the pen should have twelve feet on the floor before anyone jumps out. The penalty for failing to observe this rule to be the addition of 20 seconds per team. There should be at least one fence judge purely to watch for this. 25. ELIMINATION ON COURSE If at least 3 members of the team have not completed the course within 8 minutes of the team starting, the team will be eliminated. 26. DEPOSIT FOR NUMBER BIBS A refundable deposit of £10 per team shall be payable to the event secretary for number bibs. 27. COMPLAINTS AND OBJECTIONS Any complaint or objection in relation to an alleged breach of these rules shall be lodged with the event secretary within 10 minutes of the last horse completing the class in which the alleged breach occurred together with payment of a deposit of £40 which will be refunded if the complaint or objection is upheld. The stewards shall use their best endeavours to investigate and hold an enquiry into the complaint or objection within a reasonable time, which will ideally be within 30 minutes of the objection being formally lodged. 28. REPORT TO COLLECTING RING All teams must report to the collecting ring steward at a reasonable time before their running order. 29. JUMPING ORDER Competitors must jump the fences in numerical order and leave red flags on their right and white flags on their left. Any competitor who misses a fence must either return and jump that fence and subsequent fences in the correct order or shall be eliminated and must retire from the course. 30. NATIONAL TEAM CHASE CHAMPIONSHIP The BTC National Team Chase Championship shall take place in March/April each year on a specific date at an affiliated Team Chase to be nominated from time to time by BTC, on terms to be agreed between BTC and the organising committee.